This map shows the location of the submarine cable off the central California coast that was being used for the Sound in the Sea Project. 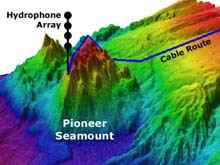 This cable stretched from Pillar Point Air Force Station to an underwater seamount (Pioneer Seamount) and was approximately 100 km long. A passive underwater hydrophone was installed on the seaward end of the cable. Data on recorded sounds was sent along the cable to a station on land for processing, then made available over the Internet. Click image for larger view. In late August, scientists sailed from San Francisco to Pioneer Seamount, off the coast of central California, and installed underwater hydrophones (known as an array). The hydrophones allow researchers to remotely monitor and record ocean sound to further their understanding of the sources and effects of ocean noise. The ocean sound data is now being transmitted live over the Internet. Passive underwater acoustic monitoring allows the detection of a variety of deep-ocean processes at long distances. Some of the sound sources to be studied include earthquakes, volcanic eruptions, landslides, marine mammal and fish vocalizations, weather, and manmade noises. The experience gained from this effort may enable scientists to expand the hydrophone arrays to other underwater cables, that can be retrofitted. Ultimately, this could lead to a monitoring network capable of acoustic exploration throughout much of the global ocean. Background information for this exploration can be found on the left side of the page. Daily updates are included below. More detailed logs of exploration activities can be found on the right. Click images or links below for detailed mission logs. Apr 24, 2002 After a short period of inactivity, the hydrophone array is delivering data again. Read about the repair effort. Sep 1 Success! Last night the science and engineering teams concluded a full day of recovery, testing, and redeployment of the array. The new location of the hydrophone array was determined early this morning. The NOAA Ship Ronald H. Brown is now in transit to San Diego. Along the way, a mapping team will gather data on the seafloor. Aug 31 The science team has arrived at the location of the submerged cable and will spend the day attempting to raise it so testing can begin. If all goes well, the team should install the hydrophone array by nightfall. Aug 30 The NOAA Ship Ronald H. Brown has been mobilized in Seattle, WA, and is in transit to San Francisco, CA, to pick up the science party. The team will then transit to the cable site to install the hydrophone array.